How do you feel about your interior wall paint colors? Happy? Tranquil? Motivated? Depressed? I'm not much of a DIY painter, but I am aware of the fact that wall colors can absolutely effect one's mood. This especially interests me when it comes to motivation and productivity, so I asked three experts their thoughts on selecting paint colors. Read on for more on how paint effects feelings, productivity and space. Disclaimer: This post contains sponsored links from Value Painting. In fact, I have painted every apartment I have rented in the last 14 years. 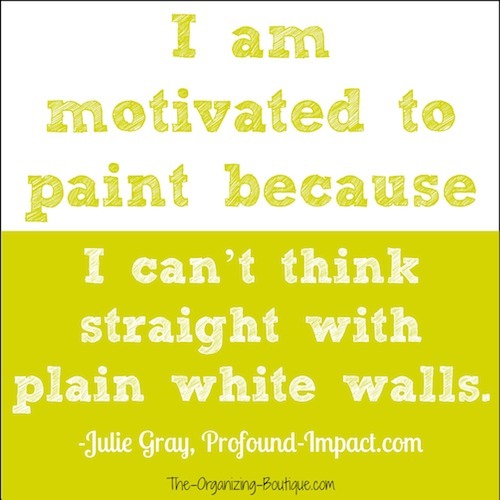 I am motivated to paint because I can’t think straight with plain white walls. Personally I believe that colors emit a certain energy and can be very grounding or unsettling depending on the color - or the person experiencing the color. Blank primer-white walls makes me feel scattered and unfocused so when I move into a new space, painting the walls is priority number one. I don’t know if the same colors effect people in the same way (although it seems there is some evidence for this) but for me to be able to focus and be productive I need to have a color but one that soothes and grounds me. One that welcomes me to my space. 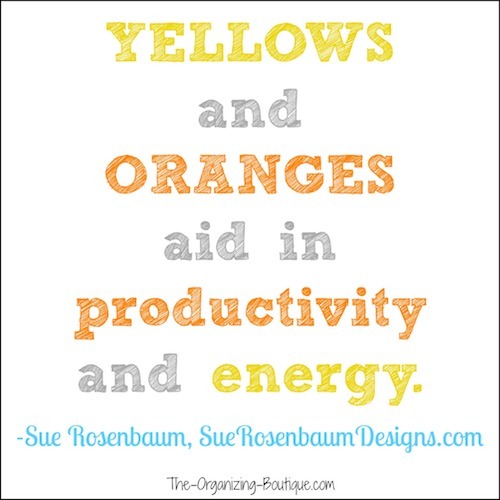 Since starting my business I’ve had my office a mossy-gray-green, a deep midnight-blue, and a soft golden-yellow - although admittedly I don’t often sit in my yellow office room but prefer to work from my dining room where there are more windows and I am surrounded by wonderfully bright olive-green walls that mirror the trees outdoors. My intuition or a dream tells me what colors to choose. I have a ton of fun with the process. We know intellectually that our immediate surroundings impacts how we think and behave. Making the colors I live in a conscious decision has helped me to use my environment to support how I wish to feel on a daily basis. How do you want to feel in the room you sleep in? Work in? Calm? Productive? Inspired? Excited? Let these emotions guide you to your color decisions. When you walk into the room and love the way you feel - how can it not impact motivate you to feel your best? 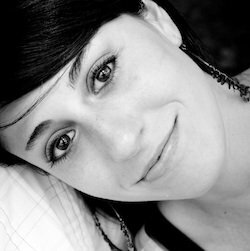 Julie Gray is a Holistic Time Coach who guides overwhelmed executives and entrepreneurs through a powerful process of change that results in more guilt-free time in your schedule and the trust in yourself to keep it that way. Taking our cues from the paint manufacturers, they generally name the colors after the feeling that is provoked when seen. 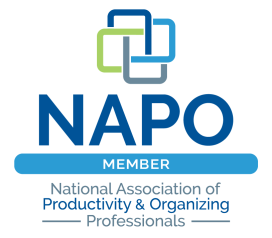 They have diverse staff with vast knowledge on color theory and researchers that study color. I happen to work with Benjamin Moore paint colors in my business and have referenced a few below. TRANQUILITY AF 490, BEACH GLASS 1564, and PALLADIUM BLUE HC-144 are wonderfully calming soft blue-green hues that immediately calm our overworked brains and senses and engage a focus and equilibrium. In general, yellows like PALE MOON 289 or PEARL HARBOR 2165-50 and oranges like SOFT PUMPKIN 2166-40 aid in productivity and energy, but I would not paint an entire room with these colors. I would select a color that I really liked and paint the wall behind your computer screen only or infuse color into a space is through window treatments, area rugs and art. That would be a perfect way to get some productive punch too. There are many myths regarding colors making a space feel larger or more cozy and intimate. Painting a room white or cream will not make it seem larger, I'm sorry to say. Carrying the color from an adjacent space is what makes it feel larger and blur the defining lines. The same is true with an atonal color scheme which refers to subtle variations of the same tone. If you want to make a space more cozy or intimate, paint a complimentary color or the same color on the ceiling. With more than 15 years of experience in the industry, interior designer Sue Rosenbaum offers an interactive process catered to the changing tastes and style of her clients. A member of the IFDA, Sue is in sync with current styles and is ready to lend her creative, fun approach to your decorating challenge. Color affects our feelings, as evidenced by so many color related phrases in our language (e.g. feeling blue, red-faced, green with envy). However, those feelings do vary from person to person. While in color theory, any blue-based color is called a “cool” color, and any yellow-based color is called a “warm” color. For someone who loves blue there are warm blues, and for someone who dislikes yellow there are cold yellows. What feels dark to one person may be very comfortable to another. The key is to find the colors and values of those colors (how light or dark the colors are) that work for you, your space, and your furnishings. Certain hues are known to have certain emotional affects: red stimulates the appetite, green is good for focus (a great color for an office or task-oriented space), and lavender is for creativity and dreams. For that reason, in my own design office, I have three green walls for project management efficiency and one wall with a colorful wallpaper mural to help me be creative when I need to think about design. There is a myth that darker colors (deeper values of colors) make a room smaller, probably because we know that darker clothing makes us look slimmer. Dark colors appear to recede. If you are looking at me and I’m dressed in black, the black is going away from you and toward my core making me look slimmer. However, in spatial terms, the deeper colors still move away from the viewer making the room appear larger. 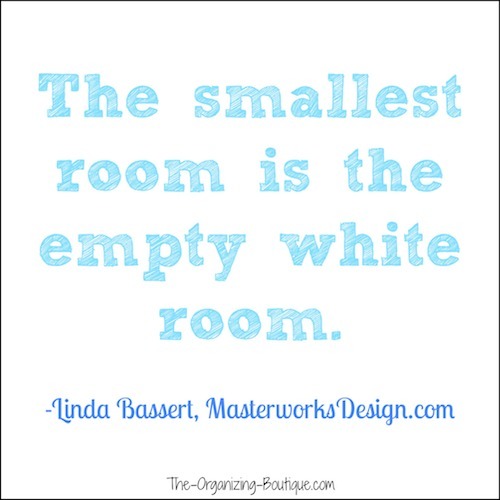 The smallest room is the empty white room. Nevertheless, we don’t choose to live with all black walls, even if they make a space appear bigger, because we also crave light. We yearn for the emotional well-being light gives us. All color is affected by light and whether you prefer deeper color values or lighter values, you need enough light in a room for it to feel comfortable and function well. We see contrast before color so to make a room feel larger, we need to have a different value of color on the walls than we have on the furnishings. If you think about the room in gray scale, the color of the wall and the color of the furnishings would be different grays. Dark furniture needs lighter walls; light furniture needs darker walls. Getting it right brings a sense of well-being and harmony into a home. It is a low cost way to update and freshen a room. It’s one of the reasons paint color consultation is so satisfying to me as a designer. Linda H. Bassert, award-winning design principal of Masterworks Window Fashions & Design, LLC, Fairfax, VA, works collaboratively with her clients to create spaces which reflect their personality and history.